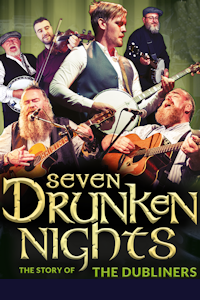 Seven Drunken Nights - The Story of the Dubliners tickets at New Victoria Theatre, Woking. 2019. Find the best Seven Drunken Nights - The Story of the Dubliners concert tickets at New Victoria Theatre, Woking. Seven Drunken Nights brings to life the music of Ireland's favourite sons - 'The Dubliners'. Telling the story of a career spanning 50 years and evoking the spirit of Ronnie Drew, Luke Kelly, Barney McKenna, Jim McCann, Ciaran Bourke and John Sheahan, this hugely talented cast of musicians and singers bring the music of this iconic group to life. Seven Drunken Nights - The Story of the Dubliners website. Seven Drunken Nights - The Story of the Dubliners tickets: The tabs above allow you to select between links to suppliers and date searching. Click on a supplier's logo to see their details and on the 'buy now' button to see and check the tickets on offer.